3D: printing the future is a new exhibition in the Antenna – science news gallery at the London Science Museum. 3D printers inspire creativity: the exhibition wall is an explosion of over 600 printed objects. But where’s the real innovation? Explore this exhibition to discover how innovators are using 3D printers to turn computer data into physical objects that could change your life. The stories we’ve uncovered focus on the future of industry, medicine and whether 3D printing will change your shopping experience. See lighter, more efficient plane parts created through 3D printing that could save fuel on your flights. Check out 3D printed replacement body parts – from those already used today, to the possible 3D printed organs of the future. Discover the open-source mechanical hand that carpenter Richard Van As made on a consumer machine to replace his missing fingers. 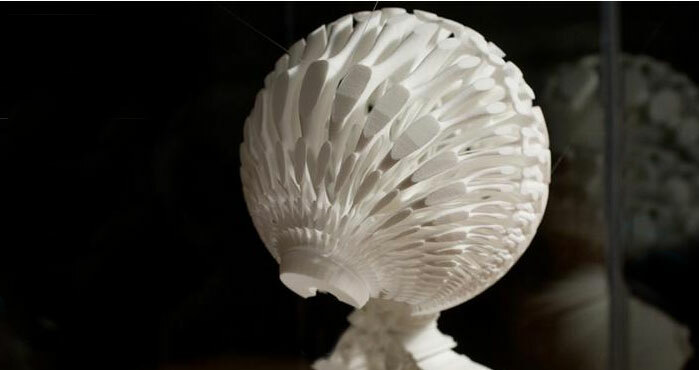 And see how 3D printing can inspire artists in Inversive Embodiment, an intricate sculptural work by Tobias Klein that incorporates MRI scans and St Paul’s Cathedral. How will 3D printing shape your future?